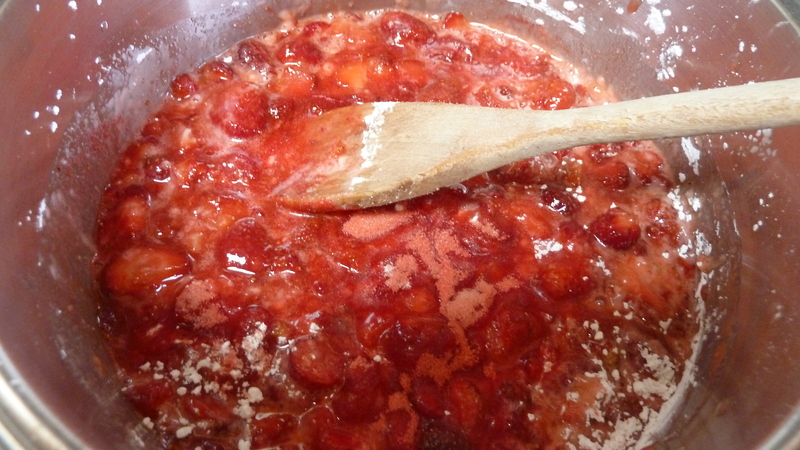 cooking, recipe, Strawberry pie, Whatever Happened to Dinner? I promised in my most recent post on picking strawberries, that today I’d write about my favorite thing to make out of strawberries. Did you guess: jam, shortcake, pie, cheesecake, or maybe a trifle? Or maybe I should ask, what is YOUR favorite thing made with strawberries? 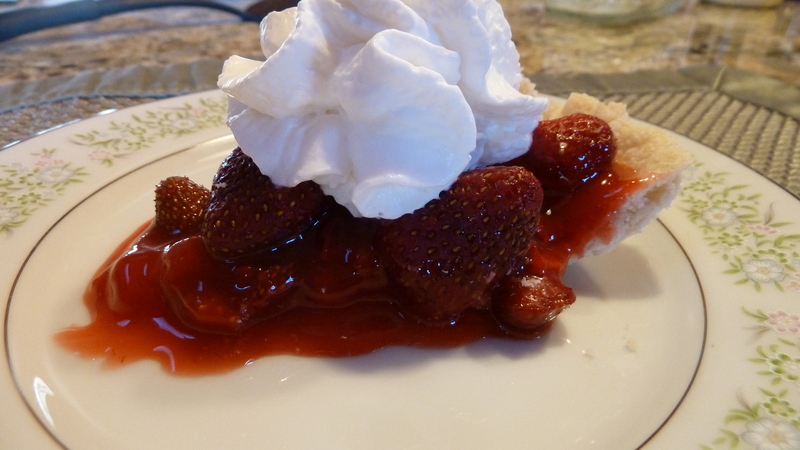 My hands down favorite strawberry thing, besides eating them fresh from the patch, is pie. Okay, so my strawberry pies are not as beautiful as the ones you see at a restaurant. But what they lack in eye appeal they make up for in full bodied sweetness and nutrition. Did you ever succumb to a beautiful piece of strawberry pie at a restaurant and then think, oh, how tasteless? All sugary glue/glaze and hard strawberries shipped from who knows where? My recipe comes from Fellowship Cooking from my home congregation, North Goshen Mennonite (Ind. ), dog-eared and grease stained, so you know it is good. Counting a strawberry chiffon pie listed there, there are FOUR strawberry pie recipes in one cookbook, but my favorite I’ve adapted from Viola Miller, the mother of one of my brother’s childhood friends. Add sugar, cornstarch, jello and lemon juice to the 1 pint of crushed strawberries; cook until clear and thick, stirring constantly. Remove from heat. When cool, put into previously baked and cooled pie shell. Add the second pint of whole or sliced strawberries—placing them one at a time for a prettier pie, or just add willy nilly. Refrigerate at least one hour before serving. Serves 6-8. May be topped with whipped cream. 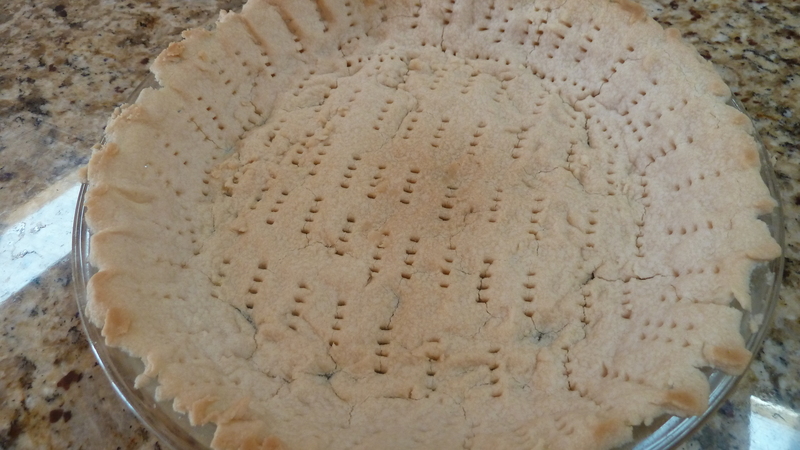 For this pie crust, I used up a half cup of lard (made 2 crusts, froze one for later use) I had in my cupboard from another cooking project. The lard was older, but not rancid, and had softened. I pieced this crust together like I was playing with Play-Doh, pinching and merging it together. It made for a very rich crust which my husband drooled over each time I served it. He has no problems with a crust that falls apart on slicing: the better the crust, the worse it looks. 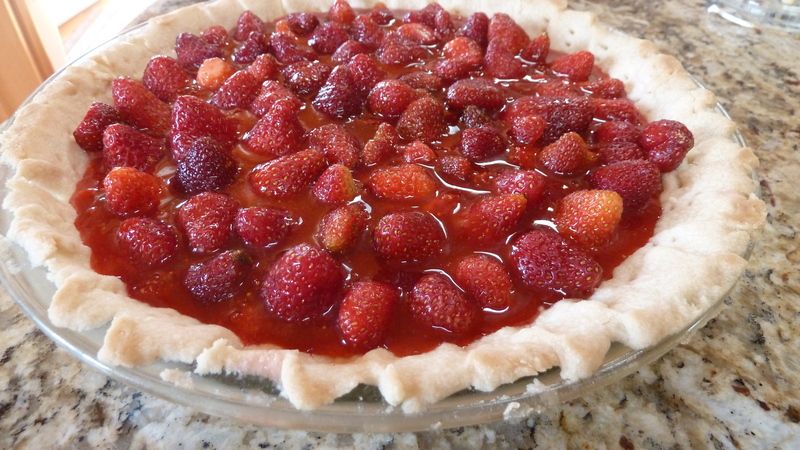 Raindrops on roses and whiskers on kittens … fresh homemade strawberry pie is one of my favorite things. Mom’s shortcake with strawberries is another, but that’s for another day. For hundreds of recipes helping you cook whatever’s in season, check out Simply in Season, from Herald Press. 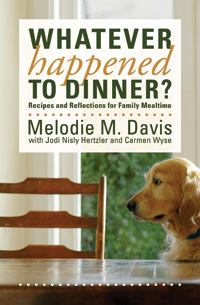 For other favorite recipes see my book, Whatever Happened to Dinner: Recipes and Reflections on Family Mealtime. 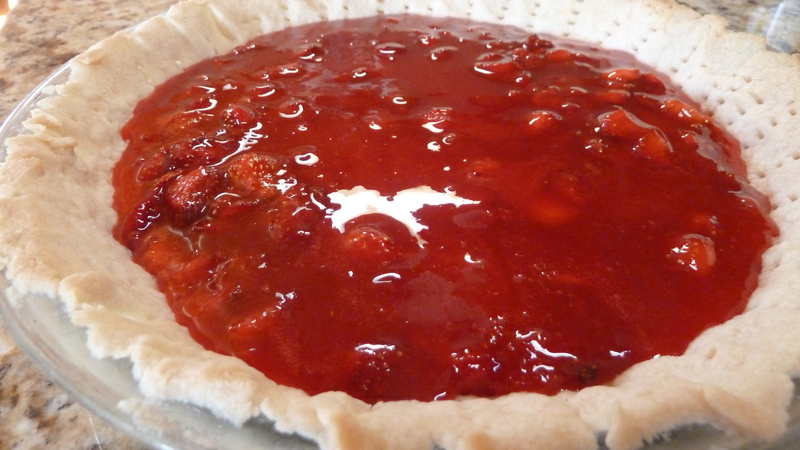 Your strawberry pie IS beautiful and I like all those doo-dads on your crust. I hate to bake very much now in Florida because of the heat. Tomorrow we go to Braddock Blueberry Farm to pick our own berries – a cool thing with the grands. I commend you for your cook-book and culinary expertise, Melodie. 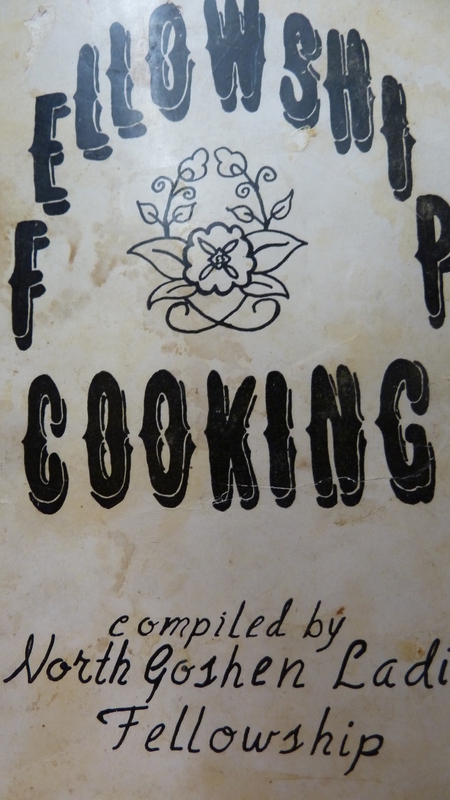 I sometimes refer to the Mennonite Community Cookbook and Extending the Table (Herald Press, 1991) with stories from around the world to go along with recipes. You are such a faithful commenter and I rued the fact that I couldn’t access my blog for a few days except to see folks had commented … Hope your berry picking went well. Can’t wait for blueberry season here. Do they grow well in north Fla.? I don’t remember. I’m no culinary expert by any means but I’m enjoying picking up things. Bless you, Marian! Not blueberry or strawberry season her yet. Still in rhubarb. But I did buy some sale strawberries and we’re having shortcake tonight. I have to make 2 kinds of “cake”…half the family prefers the sweet biscuit type shortcake and the other half (like me) prefer the angel cake. I have only ever had a strawberry pie once. It was delicious and I forgot to ask the person for the recipe. I will try yours later on when we get strawberries. I’ve been away, can you tell? Glad to hear of someone else who likes the shortcake as sweet biscuit too (the other half of your family.) Talking about shortcake, my sis and I found out something remarkable and funny from my mother about shortcake, milk and strawberries. (Funny to us, after all our lives believing one thing.) I’m doing a post on the biscuit type shortcake and will tell the story then. Thx for the comment! Looking forward to hearing the shortcake story.